5:30 am came too early, especially after never really falling asleep. We had an easy taxi ride to the airport (our cab driver loved Zorro), a long wait at the check in counter, a quick walk through lax security, a goofy experience at the cafe, and a full flight to Ushuaia (with an interim stop in Trelew). 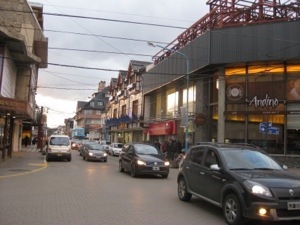 Ushuaia is located on Tierra del Fuego Island, the southern most tip of Argentina. The island was first occupied by man 10,000 years ago. The Yamana, who once lived in dome shaped huts and traveled in canoes, became extinct with the arrival of the Europeans in the 1890’s due to disease. Anyway, Aerolineas took us 1,500 miles on its 737 to get us to the tip of South America, and it even provided a box of food! We felt a little silly when at one point we were wondering if we were going to be on a prop plane. We just needed to take a minute to look at the length of Argentina! 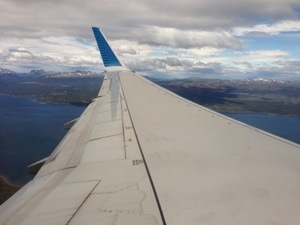 Buenos Aires to Ushuaia is about the distance of Dallas to New York, as the crow flies! We were pleasantly surprised to be met by a transfer agent, Rumbo Sur, that took us to our hotel, Las Hayas. Las Hayas is situated toward the top of the mountain overlooking the town and bay. The hotel looked well cared for, perhaps recently updated, though the flowery and striped wallpaper, striped couches, and paisley curtains suggested country decor from the 1980’s. The room safe was a bit different…it locked and unlocked with the room key. We enjoyed a beautiful view from our hotel room window! It was almost 2 by time we were situated and we were ravished, so we found the hotel restaurant and indulged. One of the specialties in Ushuaia is king crab, and I had it in ravioli…mouth watering good! We ended up resting from about 4 to 7 when we finally took a taxi to inspect town. At first I was feeling rather guilty about staying in the room so long, but having gotten little sleep for two days and fighting a cold, it was much needed. I felt less guilty, however, after we reached town and walked Main Street in less than an hour. It seems choosing to rest was a good plan. The numerous shops catered to tourists. While some carried cold weather gear, most displayed stuffed penguins, T-shirts, and post cards in the windows…no trinkets for us, only cough drops! Our lunch was more like dinner and our dinner at Andino was more like lunch. Nicole went with a chicken and ham panini, and I opted for onion soup. It was nothing to write home about. Just something to warm the insides as the wind at “el fin del mundo” or the end of the world as they like to call it was cold and strong! We finished dinner around 8:30 and have learned to ask for the check as soon as the waiter asks how is everything…otherwise the waiter seems to get lost in space. At 8:30 it was still broad daylight, same with 9:30….it started turning to dusk at 10:30 and the sun rises at 5:45 am! Despite the nap, I was still ready for bed and hit the sack relatively early. Our room had finally started to cool after leaving the window open all day. I wonder if we will be getting up in the middle of the night to close it! 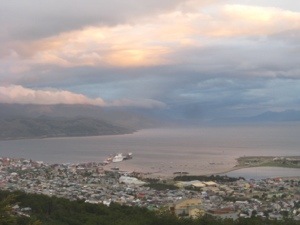 We plan on a more active day tomorrow, hiking in the Tierra del Fuego National Park. Until then…ETB. Beth, thanks for keeping me in your distribution list. I enjoy reading your daily logs. I always wanted to go to Antarctica. Enjoy.your adventure.